The New Team Varispeed 50 pump is a twin impeller pump that is designed to boost both the hot and cold water supplies to your shower. This is a GENUINE Replacement for the Showerforce Turbo 2 Pump. *Please Note: The Varispeed 50 Pump Shower Pump is currently unavailable the button below will take you to our Turboboost 50 MK2 + pump, this is a direct replacement WITHOUT the need to make any plumbing alterations. 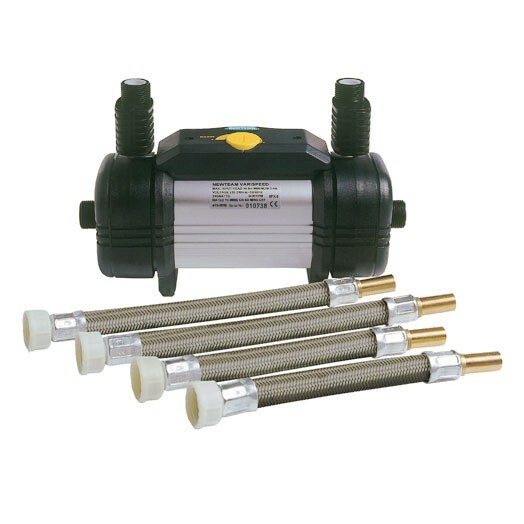 This is a GENUINE REPLACEMENT for the Showerforce Turbo 2 Pump and includes the original flexible hoses with Brass ends to connect to your plumbing supplies. This pump will be a DIRECT Replacement without the need to do plumbing alterations. Some of our competitors are offering a similar pump that is supplied with push fit hoses. You will need to undertake plumbing alterations to your existing pipework to fit this pump. This pump is to be used with a gravity fed water system, it is not suitable for use with combination boilers or mains pressurised water systems. We recommend that all Varispeed pumps are fitted in the airing cupboard with the cold water supplied from your cold water storage tank, this is usually found in your loft, and the hot water supplied from your hot water storage cylinder. The cylinders water supply must come from the cold water storage tank. For more advice please see the fitting instructions. Do you need advice or help choosing your new pump? Please call the Tapstore.com helpline on 0843 658 0062.